This flavour-packed salad is a rich source of protein, potassium and iron. Plus, it’s low in saturated fat. Place the garlic, sugar, five-spice, lime juice, chilli and a little pepper in a bowl and stir to combine. Add octopus and stir well until evenly coated. Stand while you make the salsa. For the salsa, combine mango, onion, chilli, coriander, oil, lime juice and some salt and pepper in a bowl. Set aside. Preheat a barbecue or chargrill pan on medium-high heat. Cook octopus, in batches if necessary, for 2 minutes, turning, until tender and charred all over. Transfer to a bowl and squeeze over the lemon. 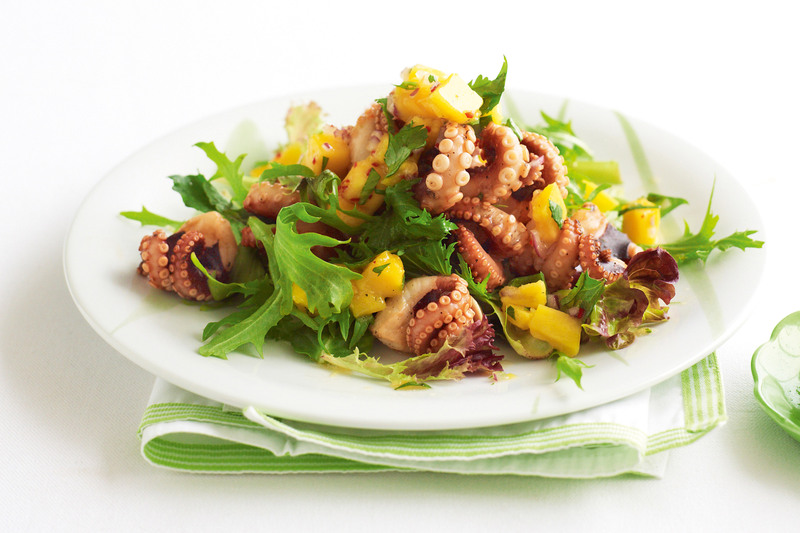 Arrange salad leaves and octopus on plates, then top with the mango salsa.